I’ve had more requests for my At Any Age series lately, so I’m really going to try and do them every few weeks going forward! This next topic is actually thanks to one of your fellow readers, who reached out to me asking about what to wear for date night when it’s incredibly cold out. This particular reader lives in a spot where the temps hit below zero this time of year! While I’m not an expert in dressing for this type of climate (born and raised Texas gal here! 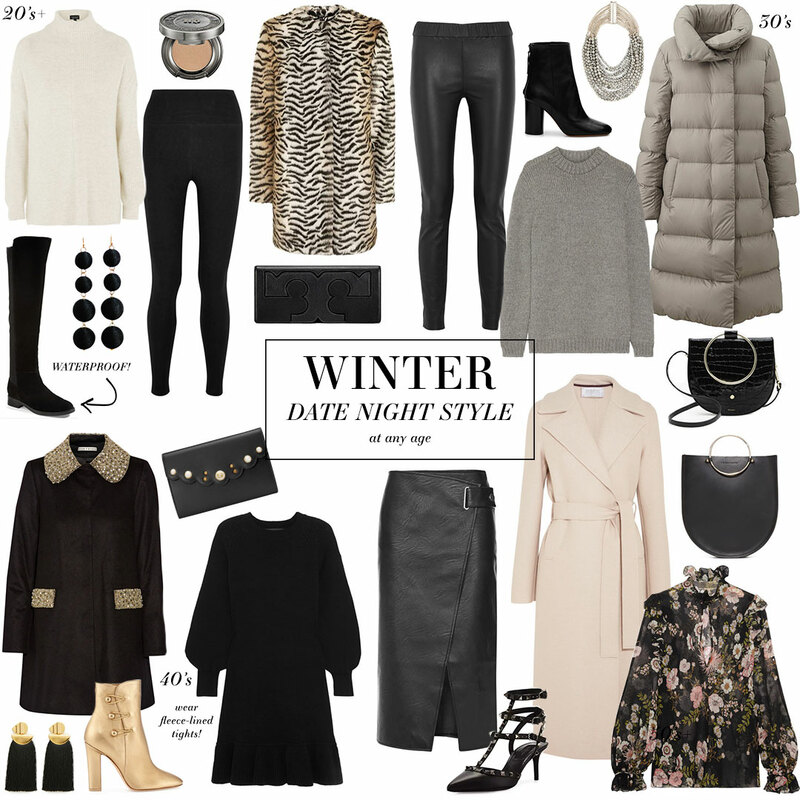 ), I did think this would be a great opportunity to put together a few date night looks for winter! Obviously layering is key, especially if you plan to walk wherever you’re going. Another recommendation would be to invest in a chic, polished coat. It’s an easy way to instantly dress up your outfit this time of year, and you can save it for special evenings and date night! Here are some date night outfit ideas for every age – hope this helps! 20’s+ // If it’s crazy cold out and you walk a lot in your city, I’d personally just opt for a cozy sweater, heavy faux (or real) fur jacket, fleece-lined leggings and a pretty pair of over-the-knee boots (heeled or flat). I think as long as your top layer (coat) and accessories look polished, you won’t look too casual. This is a great date night look after a day on the ski slopes! 30’s+ // An easy way to dress up more casual sweaters and outerwear is to pair them with leather or leather-look leggings, and a comfortable pair of heeled boots. Top the look off with a statement necklace and an on-trend bag and you’re good to go! 40’s+ // I love a good sweater dress for more elegant looks throughout winter. Pair it with a statement boot and embellished coat for a special date night look. This look is definitely more cab-to-curb, so I definitely wouldn’t recommend trying to walk in these shoes over snow or ice… but who wants to walk to dinner in almost sub-zero temps, anyway? 50’s+ // A blouse like this one would instantly dress up any pair of leggings, trousers or skirt. Top it with a coat that brings the color out of the print, and pair with a chic bag and comfortable low heels. Easy to walk in, but this is definitely a cab-to-curb look too! Shop the looks in the text above! Love this series and these picks! The leather skirt and the blush coat are beyond perfect. Yay! You’re awesome at these. I love all the 30s stuff but I’m 48???? L:OVE LOVE LOVE! These outfits are everything.